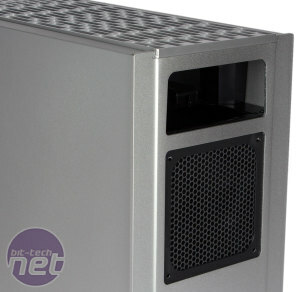 SilverStone's Fortress series of cases is the premium version of its Raven range. We didn't see the latest Raven, the RV05, when it was launched, but with us today is the Fortress FT05. 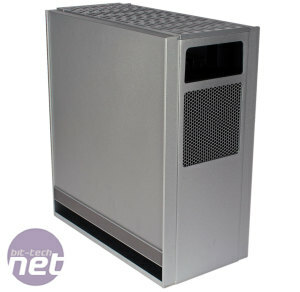 As usual, the focus is on premium aluminium build quality and top notch air cooling. 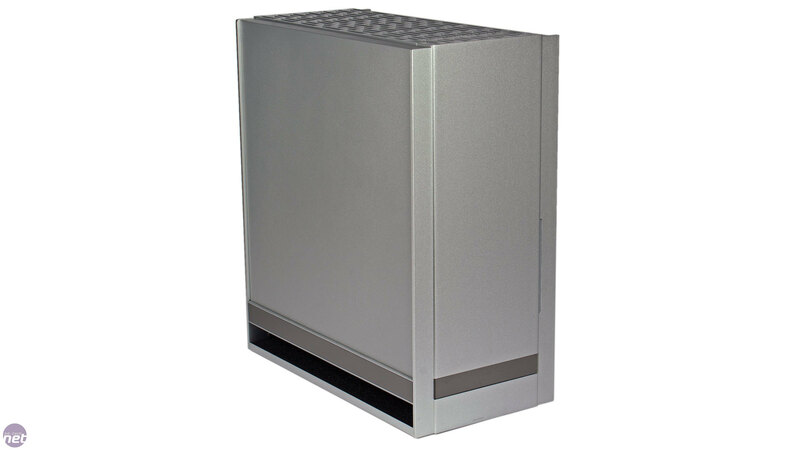 In true SilverStone fashion, the company has here turned traditional case design quite literally on its head, though you'll have to read on to discover more about that. The FT05 retails for around £50 less than the FT04 launched at last year. 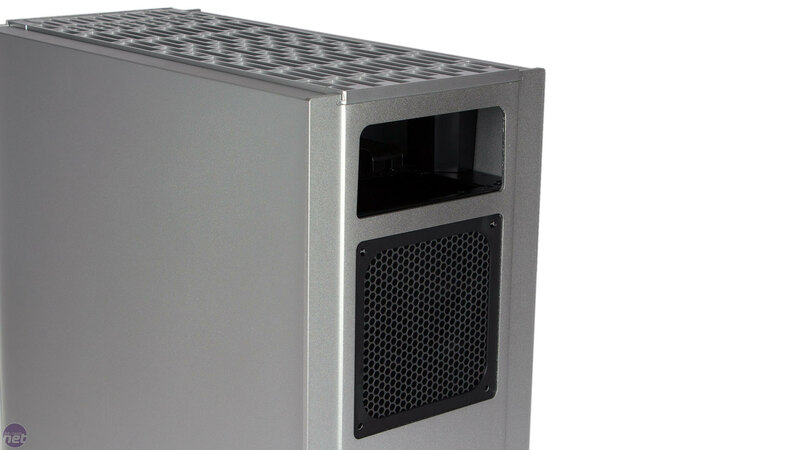 It is admittedly a slightly smaller case, but this is a good move on SilverStone's part, especially as build quality for the most part is still outstanding. The thick aluminium panels equip the FT05 with a rigidity rarely seen these days – it's awesome to see aluminium used to this extent. The thick rubber feet along the bottom give the case excellent grip as well. There's a slightly reflective acrylic trim around the bottom of the case, and at the front the power LED shines through this displaying the SilverStone logo in a rather swanky fashion. You'll also note the bottom cutaway section with noise dampening foam along the floor. This is because the FT05's main intake section is actually along the floor, as the case has a rotated internal design with a bottom to top airflow approach. In fact, the external design as a whole is something of a return to form of the much loved FT02, but with an even cleaner finish and sharper angles. 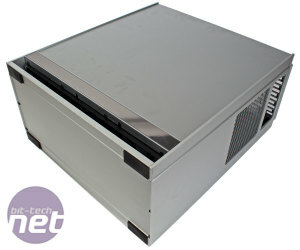 There are no features to speak of on the side panels but on the front one there is a blanked out section for a vertically mounted slimline optical drive on the right, which must be slot-loading to be compatible. One area where the build quality is a let-down is the roof. We were excited when we first saw the thick rectangular mesh here, thinking it to be a CNC milled sheet of aluminium. However, it's actually made from plastic, and a rather flimsy plastic at that, so while it certainly looks the part, it doesn't feel it. Of course, having it hewn from aluminium would've drove up the cost, but equally the Fortress series has never been about winning the value race. 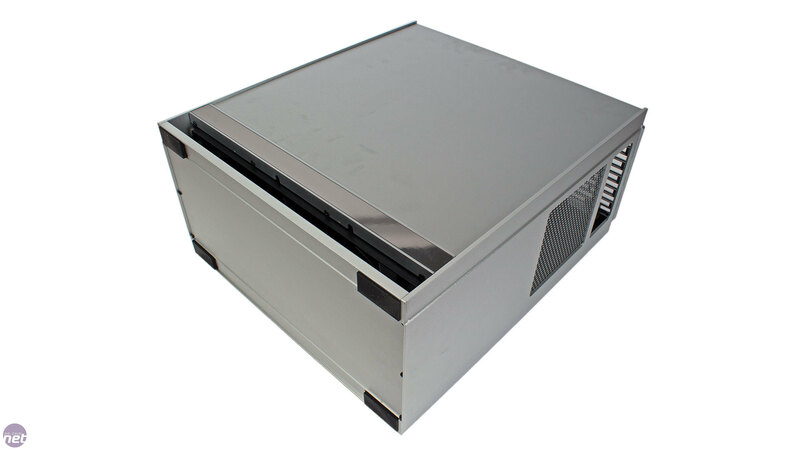 At the front of the roof is the I/O panel, featuring the standard selection of USB 3 and audio ports as well as two fan control switches, which offer independent three speed control of the two 180mm intake fans in the bottom. 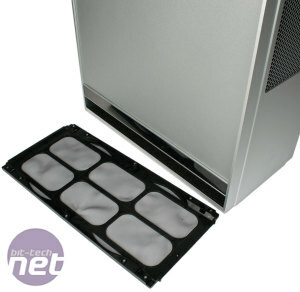 The panel is shielded by a spring loaded plastic cover, which is easy to flick open and close. A potential downside to the rotated design is that dust is free to fall into your system through the roof when it's switched off. 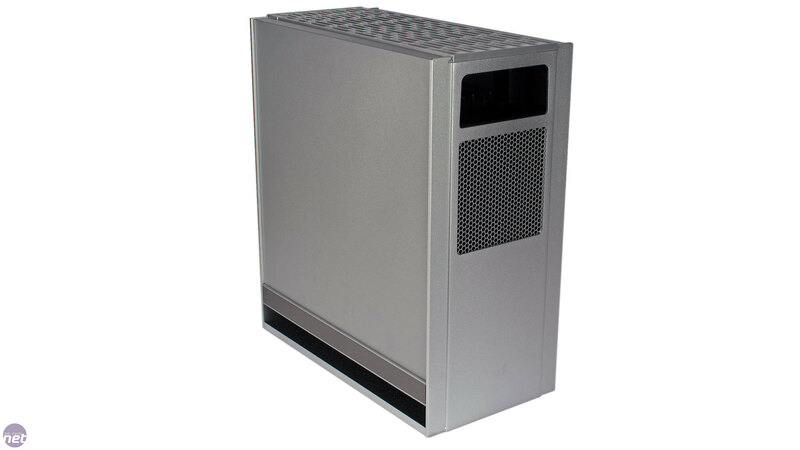 Of course, with the system on, the positive air pressure design (two powerful intake fans, no exhaust fans) will help to evacuate dust from the insides. The dual intakes are also guarded by a large magnetic filter, which clips on inside the cutaway section. 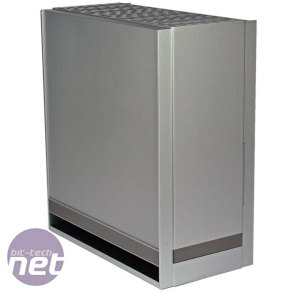 Likewise, a magnetic dust filter is provided for the rear ventilated section which makes up the PSU's intake area. 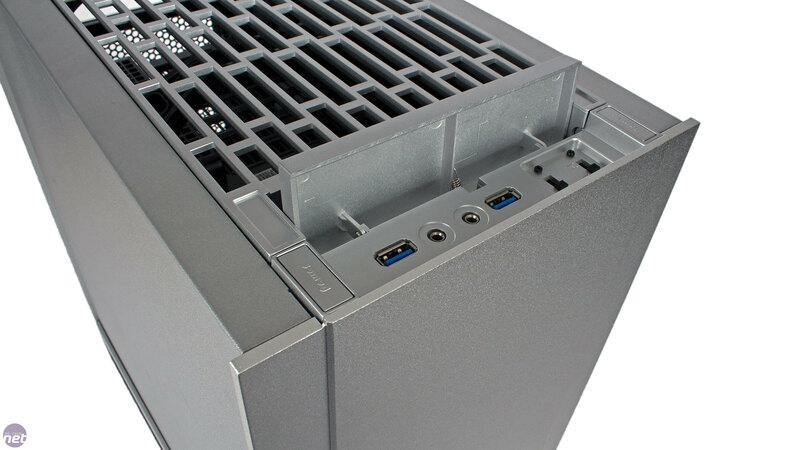 The rear cutout means external I/O cables are still neatly routed out the back. 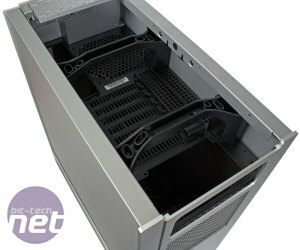 You can access the PSU's on/off switch through this hole too with relative ease, but for any other connections (those on your motherboard and GPU, for example), you'll need to slide out the roof guard, which is thankfully another simple task. 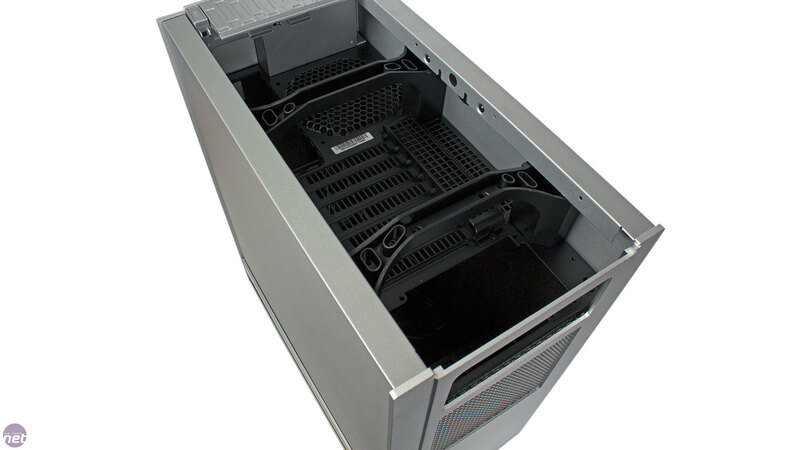 With this removed, you can see the case's single exhaust fan mount, just behind the front I/O panel, as well as its two handles for easier transportation. 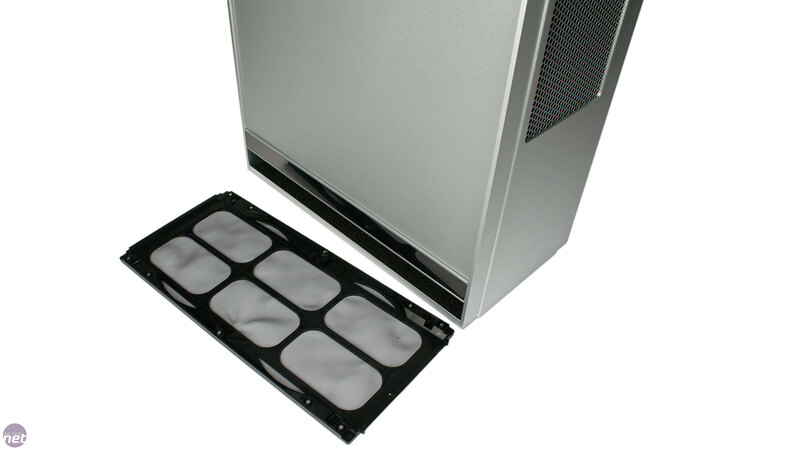 This allows you to bolster the airflow even more or install a 120mm radiator-based AIO liquid cooler.